IMPORTANT: This Region 2/4, PAL encoded DVD set will not play on most DVD players sold in the US or Canada [Region 1]. This item requires a region specific or multi-region DVD player and compatible TV. However, they may work in your computer's DVD drive. Region 2/PAL encoded DVDs play perfectly in my new HP laptop. Check your manual for more information. Fabulous Films, in conjunction with Shout! Factory, will be releasing a Region 1 NTSC encoded DVD set of the complete series June 8, 2010! The set includes everything listed in the Region 2/4 set. You can pre-order it now at the Shout! Factory Store for just $32.99! Due to exclusive deals made by Fabulous Films, this item cannot be shipped to the UK, Australia or New Zealand at this time. HMV has a 6 month UK exclusive on this item. HMV customers also have the opportunity to purchase a signed print through their purehmv program. It is also available for purchase in Australia from EzyDVD. Action, drama, comedy, romance...and a one-eyed, talking dog! 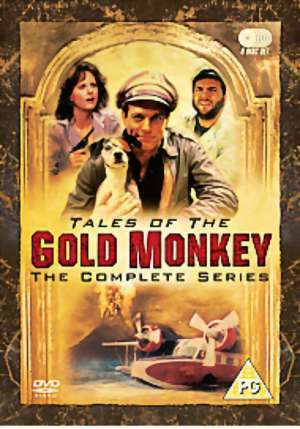 Yes, you can relive the high-flying adventures of Jake Cutter, TV's best answer to Indiana Jones, in this classic cult series from the early '80s, now for the first time on commercial DVD!! This 6 disc set from Fabulous Films includes the complete series -- The 2 hour pilot movie and the 20 subsequent hour long episodes -- uncut. In a backwater corner of the South Pacific a young American adventurer and his ragtag group of friends become involved in death-defying hi-jinx, transporting people-on-the-run in a well-worn Grumman Goose seaplane. Set in 1938, this series captures the ambiance and character of a mysterious romantic era. Broadcast on BBC1 in 1982, this series became a massive hit following the success of Indiana Jones's 'Raiders of the Lost Ark'. Fabulous Films proudly present the complete series for your entertainment pleasure, here finally on DVD!